Go into any antique market here in Shanghai and you’ll find plenty of reproduction posters featuring the famous “Shanghai Girls” of the 1920s and ’30s. These were calendars and advertisements for products like alcohol, cigarettes, soap, and so forth that featured qipao-wearing beauties with pale skin, pinned-back wavy hair, and a gentle demeanor. The Shanghai Girls posters advertised products associated with modernity and the West using “traditional” Chinese elements (silk qipaos, jade bracelets, natural scenery in the backgrounds) that actually weren’t always so traditional (the tight, slinky qipao is a 1920s design). 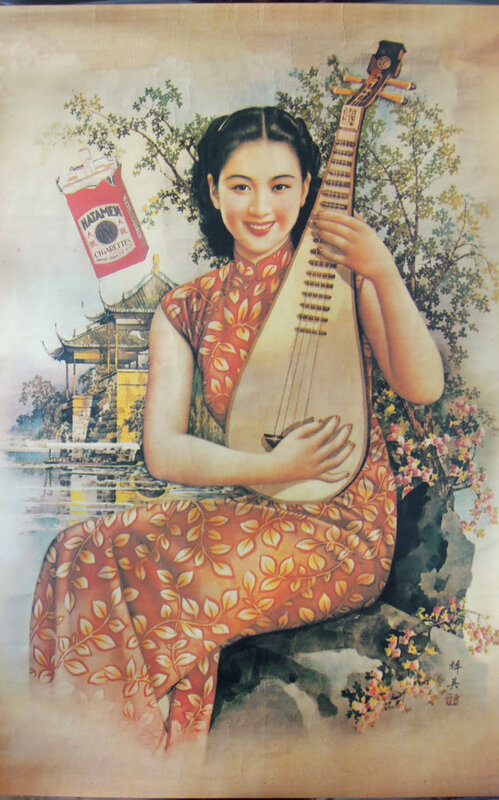 Shanghai Girl posters obviously disappeared during the Mao era, to be replaced by Socialist Realist propaganda art, but plenty of restaurants and stores have brought them back in advertisements and as decorations today. Using these images is a way to suggest vintage glamor, much like companies in the U.S. that designed 1950s-style ads after Mad Men became popular a few years ago. 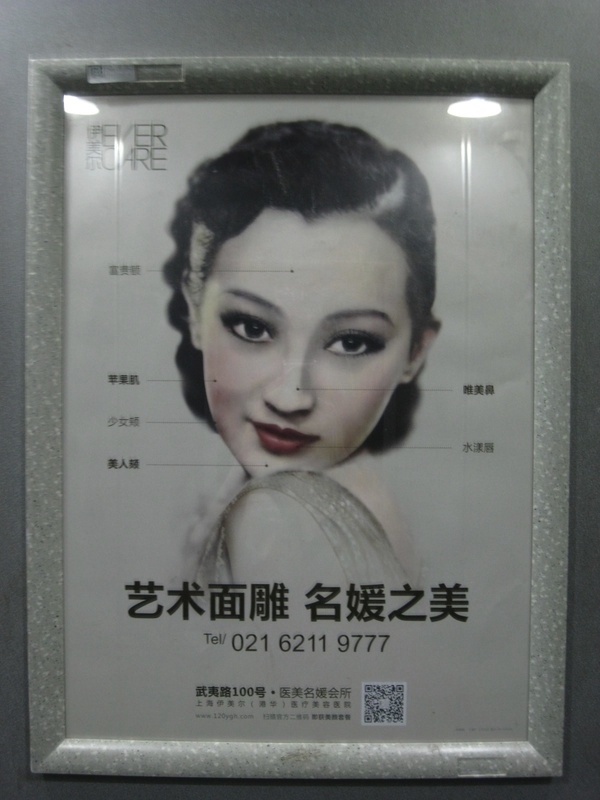 When I walked into the elevator in my apartment building one day last week, I found a new use for the classic Shanghai Girl image: to sell plastic surgery. This is an advertisement for Ever Care, a cosmetic surgery clinic in my neighborhood. Plastic surgery is a growing business here—especially among women seeking employment—and I constantly see ads for it, but this one obviously caught my eye for its use of a historical reference in its imagery. Not a great photo—the elevator only has two dim florescent lights—but the lines you see are pointing to the attractive features on the woman’s face. She has a forehead that reflects wealth (富贵额) and “a young girl’s cheeks” (少女颊) that feature “apple muscles” (苹果肌; I’m assuming that means red and firm). Her chin is that of a “beautiful person” (美人颏), as is her nose (唯美鼻), and she has a “rippling lip” (水漾唇; presumably a reference to the shape of her upper lip). Curiously, the ad doesn’t say anything about the shape of the woman’s eyes, even though “double-eyelid” surgery is a popular procedure in East Asia. My guess is that Ever Care doesn’t want to publicly advertise a procedure that suggests women want to look less Asian, though before-and-after photos of eye surgeries are prominently featured on their website’s home page. So if you’re less than pleased with the shape of your chin or the tilt of your nose, head down to Ever Care and tell them you’d like the Shanghai Girl package. Qipao sold separately.